i ran across a video for JIBO “The World’s First Family Robot” and automatically assumed it was a parody or some attempt at viral comedy. but no – it’s legit! maybe it’s just me but that video really strikes my creepy nerve ( along with other concerns ) but it is an interesting way to avoid the uncanny valley. could go in interesting directions if it’s going to end up being a platform you can build on. 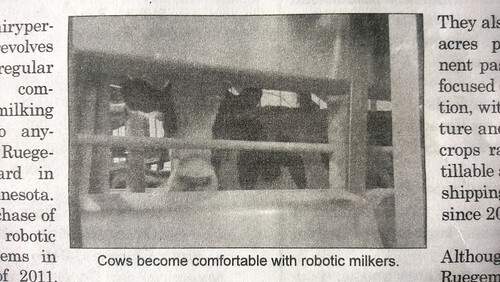 cows become comfortable with robot milkers. maybe it’s just me, but whenever i see the phrase, “robot milkers”, i imagine robby the robot lumbering in to sit on a milking stool. and so i imagine this cow is peering out looking at robby and i have to say she doesn’t look particular comfortable.